In April of 2009, the world health organization (WHO) declared that a unique influenza A virus have surfaced. Then On June 11th, the decision was made by Dr. Margaret Chan, Director-General of WHO to lift from phase 5 to a phase 6 Pandemic (statement from Dr Chan). This is a pandemic alert of the highest order possible. Under phase 6 conditions, the Secretary of Health and Human Services (HSS) is able to declare mandatory vaccination under the Public Readiness and Emergency Preparedness Act (PREP). There is no criteria listed stating what constitutes a threat. The HHS web site states the Secretary may “issue a declaration…that provides immunity from tort liability (except for willful misconduct) for claims of loss caused, arising out of, relating to, or resulting from administration or use of (vaccine or other pharmaceutical) countermeasures to diseases, threats and conditions determined by the Secretary to constitute a present, or credible risk of a future public health emergency…” This interprets that if you or your child is harmed by a vaccine during these conditions, there is nothing you can do about it. With this statement, the government has made it clear that it would rather protect corporate interests than your interests. It is now time to stop giving the government your blind trust. It is now the time to become educated about flu vaccines. During the course of human history, practically all the great crimes against humanity have been carried out by governments, more often than not in the name of peace, prosperity and security. We know unmistakably Governments are certainly capable of doing this if properly motivated. Dropping nuclear bombs on civilian populations in Japan. Israel showered white phosphorous on Palestinians. Americans fired millions of rounds of depleted uranium rounds into targets in Iraq and Afghanistan. 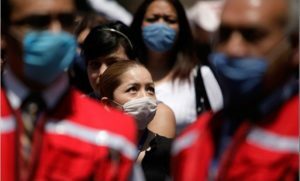 Therefore, unleashing a viral biological weapon in Mexico City is no great leap beyond what ‘Governments’ have already done to achieve their goals. Debate continues over the possibility that swine flu is a genetically engineered virus. At the moment, there is no conclusive evidence of laboratory origins for this H1N1 swine flu. The hybrid origin of the viral fragments found in H1N1 influenza is extremely suspicious. An extensive analysis of the virus has found that it contained the original 1918 H1N1 flu virus, the avian flu virus (bird flu), and two new H3N2 virus genes from Eurasia. An infected bird from North America would have had to infect pigs in Europe, then be re-infected by those some pigs with an unlikely cross-species mutation that allowed the bird to carry it again, then that bird would have had to fly to Asia and infected pigs there, and those Asian pigs then mutated the virus once again (while preserving the European swine and bird flu elements) to become human transmittable, and then a human would have had to catch that virus from the Asian pigs in Mexico and spread it to others. Rationally, the likelihood of such a combination of seemingly unlikely, trans-continental events taking place is ridiculous. It is enormously improbable that this could have happened “naturally,” without human intervention. It’s not outside the realm of possibility, of course, but it seems exceedingly remote that such events happened without some human encouragement. Eleanor (or Eleanora) McBean, author of Vaccination Condemned and The Poisoned Needle: Suppressed Facts about Vaccination, was a survivor of the 1918 “Spanish Flu” pandemic. She explains that the 1918 pandemic was the result of a nation wide effort to vaccinate the population of the US and several other countries. Her first hand account, as an unscathed non-vaccinated child whose non-vaccinated parents tended to the ill with no repercussions, along with survivor interviews clearly shows that those who did not get vaccinated were spared, while many apparently healthy people dropped dead or were crippled soon after receiving the heavily promoted vaccinations. Eleanor also mentions how a large percentage of contaminated Americans were cured by natural or homeopathic means. The vaccines had been inoculated into soldiers made by the TYPHUS FEVER VACCINES injected into millions of soldiers during the Great War (WW I). John D. Rockefeller labs and factories in China produced these Typhus vaccines in 1916 by harvesting pus from infected humans, injecting the infectious matter into pig hosts and then mixing the harvested contaminants into chicken egg albumin to be injected into human hosts as a “vaccine”. The soldiers began getting ill in training camps in Spain, after their vaccinations. Some of them became paralyzed, similar to what happened to the many that had received the 1976 Swine Flu vaccinations and were stricken with the rare Guillienne Barre syndrome. More may have died as a result of vaccine induced illness than from actual battle. The war ended sooner than expected, after only around a year of American involvement. So the left over vaccines were pushed for profit onto the public in the USA and other countries as fear mongering was promulgated about soldiers returning from abroad with the deadly “Spanish Flu”. The campaigns were persuasive enough to get many to roll up their sleeves, and the results were disastrous. Many millions died in several countries over the next year and a half to two years. But Greece refused the vaccines, and Greece had no deaths from any type of flu. Vaccine manufacturers have been in a competitive struggle to produce the first vaccine. The main candidates have been Baxter Pharmaceuticals and Novartis Pharmaceuticals. Both of these companies have had agreements with the World Health Organization to produce a pandemic vaccine. The Baxter Company has been associated with two deadly scandals. The first event occurred in 2006 when hemophiliac components were contaminated with HIV virus and injected in tens of thousands of people, including thousands of children. Baxter continued to release the HIV contaminated vaccine even after the contamination was known. The second event occurred recently when it was discovered that Baxter had released a seasonal flu vaccine containing the bird flu virus, which would have produced a real world pandemic to 18 countries. Providentially, lab workers in the Czech Republic discovered the deadly combination and blew the whistle before a worldwide disaster was unleashed. Those who know the safety procedures in producing pharmaceuticals declare there was no way for this to be an accident. Yet no consequences for Baxter came of this. Despite these two deadly events, WHO maintains an agreement with Baxter Pharmaceuticals to produce the world’s pandemic vaccine. The media and WHO insists that getting a vaccine will protect you from the swine flu. But it is just a big lie. Even if the vaccine produces antibodies, it is not the same thing as real-world immunity from a live virus, especially if the virus mutates (as they often do). Dr. Yeny Gregoria Davila posted on the BBC website, vaccines were given to the medical personnel and those very same medical personnel were dead within six days. Thus, the vaccine is certainly not protecting these people from infection. Vaccines contain a number of hazardous materials that is more dangerous than the flu itself. Adjuvant – Immune adjuvants have shown in a number of studies that cause devastating autoimmune disorders, including rheumatoid arthritis, multiple sclerosis and lupus. Adjuvants contain squalene, a type of oil. The Chiron company, maker of the deadly anthrax vaccine, makes an adjuvant called MF-59 which contains two main ingredients of concern—squalene and gp120. 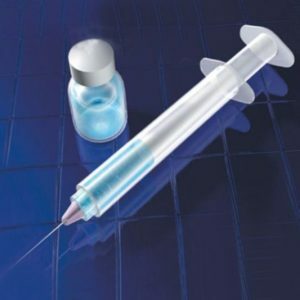 A number of studies have shown that squalene can trigger all of the above-mentioned autoimmune diseases when injected. Mercury – Thimerosal contains approximately 49% ethyl mercury and is used as a preservative. Mercury is among the most toxic heavy metals and is known to poison the central nervous system, liver, gastrointestinal tract and other systems in the body. None of the vaccines have been subjected to real-world testing for any meaningful duration. The “safety” of these vaccines is nothing more than wishful thinking. The question to ask yourself on this is the usual one: Who benefits from a global pandemic?